A big Wyoming “howdy” to you! Thanks for stopping by. Visit my blog – and come back often to see what's new. I'm eclectic, so you're likely to find a blog on ... well, who knows. Check out the Portals Series page to see what's new. If you're curious about me ... Click on About P.L. Blair. The Other Authors and Books Page features some authors whose works I enjoy. Under "more" you'll find my contact information, plus a few reviews that have been posted on my books. 'Course you can always visit the book pages at Amazon for more on that. This site is a continuing work in progress, and I hope to add more pages in future. Maybe some photos of my canine and feline family. Thanks for dropping by, and I hope I'll see you again soon! 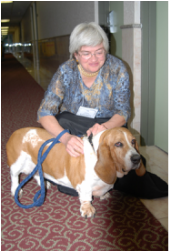 This is one of my favorite photos of me and Shilo, the gorgeous basset hound girl I adopted back in 2008 from Wyoming Basset Hound Rescue.